As promised , here i am with Day 3 pics and updates of PFDC L’Oréal Paris Bridal Week .As many of you already know that i was invited as a media representative for the coverage of all four days of PFDC L’Oréal Paris Bridal Week . I am really thankful to L’Oréal Paris and Lotus Client Management & Public Relations for giving me this great honor. I am so grateful to them for their kind hospitality. 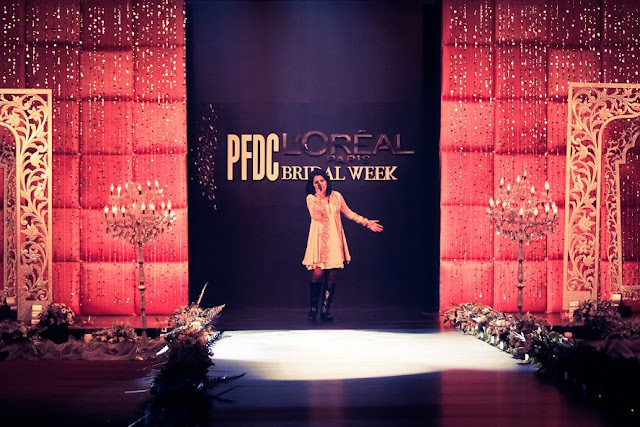 So , are you Still wondering what has the PFDC L'Oreal Paris Bridal Week got for you? Through this Bridal Week PFDC & L’Oréal Paris endeavour to define and present contemporary and traditional Pakistani Bridal fashion, jewellery and make-up trends with bridal week, fusing to create the ‘look’ for the bridal season - Because you're worth it! 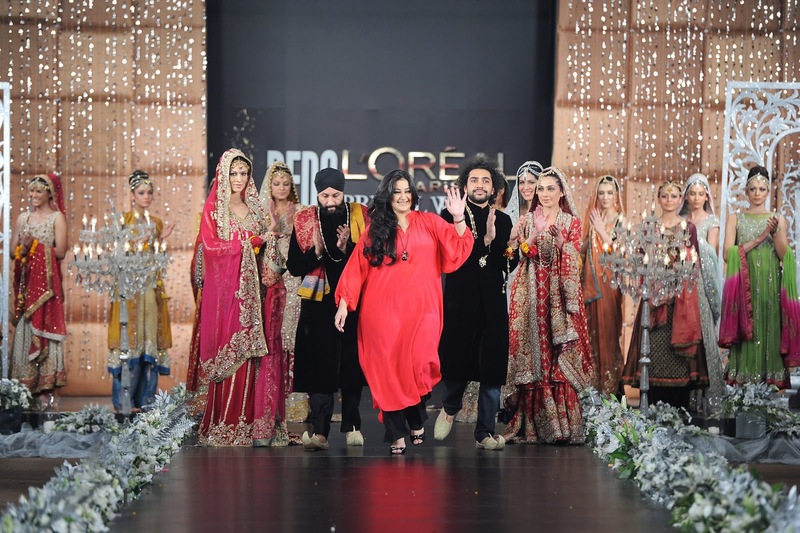 L’Oréal Paris, the world’s leading beauty brand, and the pioneering Pakistan Fashion Design Council [PFDC] presented day 3 of the PFDC L’Oréal Paris Bridal Week - a platform that endeavours to define and present contemporary and traditional Pakistani Bridal fashion, jewellery and make-up trends, which together create the ‘look’ for the Bridal Season 2012. 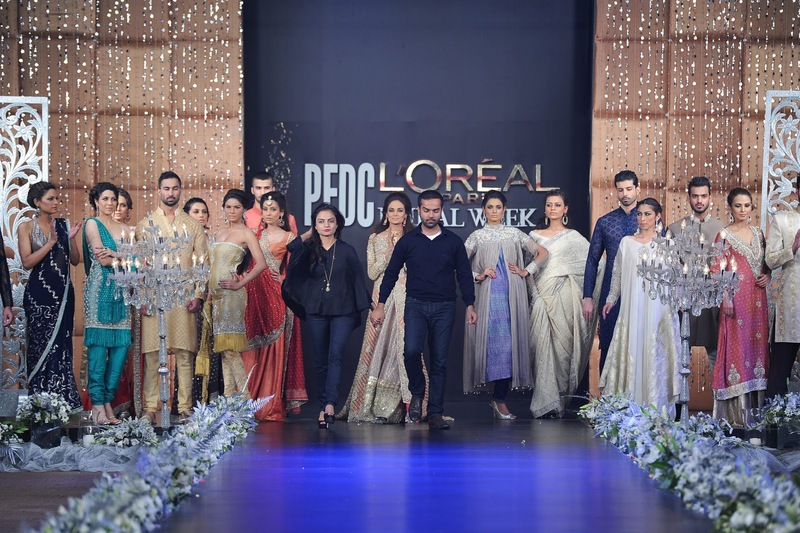 The third day of the PFDC L’Oréal Paris Bridal Week was dedicated to fashion designers showing their bridal collections with solo shows by Ali Xeeshan, Rouge, Sara Rohale Asghar and Asifa & Nabeel. 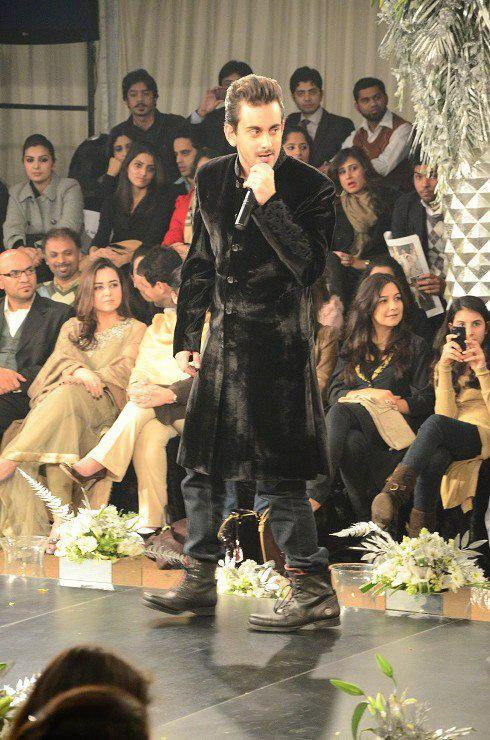 It was attended by celebrities, media as well as the fashion fraternity. 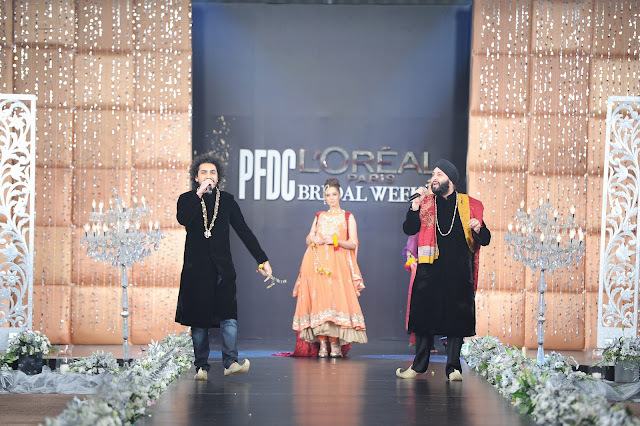 Each day of PFDC L’Oréal Paris Bridal Week is being styled by a different creative team and to this end models on Day 3 were styled by Toni&Guy led by Shammal Qureshi with men’s styling by Khawar Riaz. The PFDC L’Oréal Paris Bridal Week is being produced by Catwalk Productions, with event coordination by R-Team, set design by Hamza Tarar, official photography by DragonFly and public relations by Lotus. 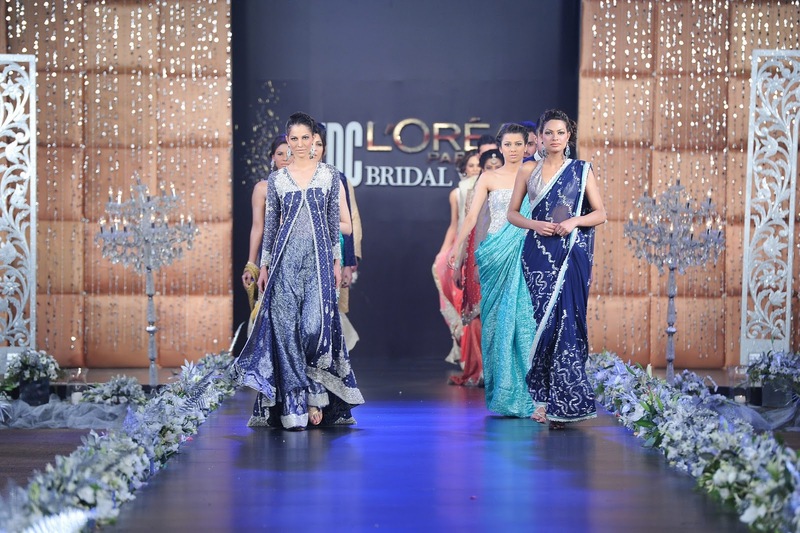 The Black Carpet for PFDC L’Oréal Paris Bridal Week is sponsored by Damas. Day 3 of the PFDC L’Oréal Paris Bridal Week was opened by Crimson by Ali Xeeshan with a collection titled ‘Pahalgam’. Named after the breath-taking city in the valley of Kashmir, the Pahalgam collection was the designers’ interpretation of what he envisions the city to look like and the magnificence it captures. 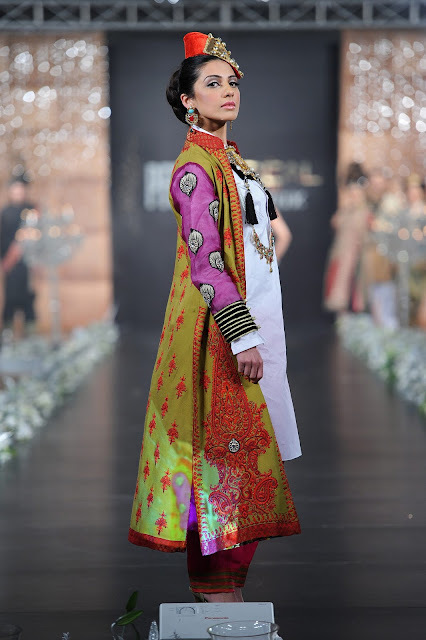 His collection represented brides adorned in plain fabrics of different kinds; ornamentation and decoration-free clothes that represented a vivid play of colour. 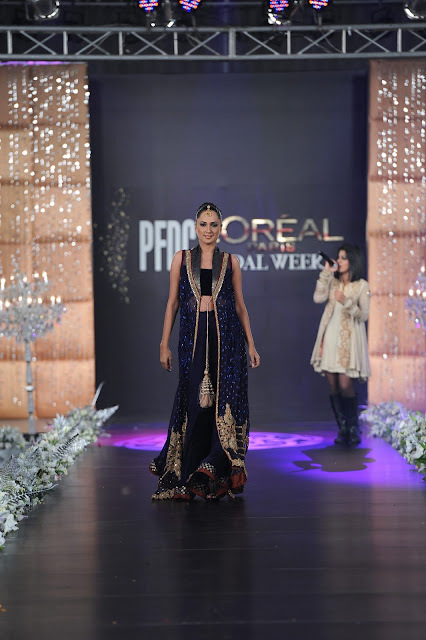 With Pahalgam, Ali looked to prove that style and beauty originate from within a person’s own character rather than the amount of embellishment on a piece of clothing. Designed especially for today’s chic bride who wants to pull off an unconventional ensemble, Ali Xeeshan’s Pahalgam bridal showcase highlighted that the splendour brides relish, will only come from within. I can truly say that What a collection it was . I love the idea that the designer covered the whole bride and grooms family dresses . I so love it when the bride came with her two brothers ( supposed to be ) holding Quran and bouquet above her head . 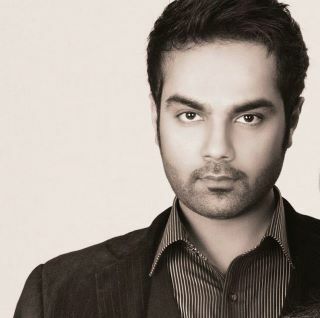 What a creativity and the music was too good. 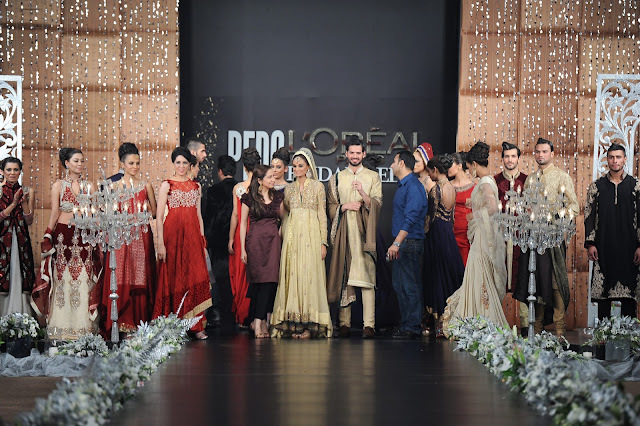 Following Ali Xeeshan’s bridal showcase was a solo fashion show by Rouge with a contemporary fusion collection; a tribute to designer Faraz Manan’s mother, Memoona Manan. 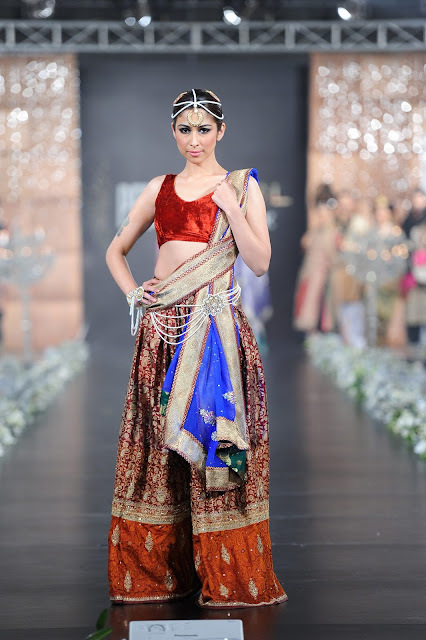 Crafted in Persian cultural embroidery, ‘zardozi’, with jewel-based embellishments across colours such as navy blue, kelly green, gold, off white and coral pink – Memoona’s favourite colours – ganga-jamni was also used in select outfits, creating an overall vintage look and feel. 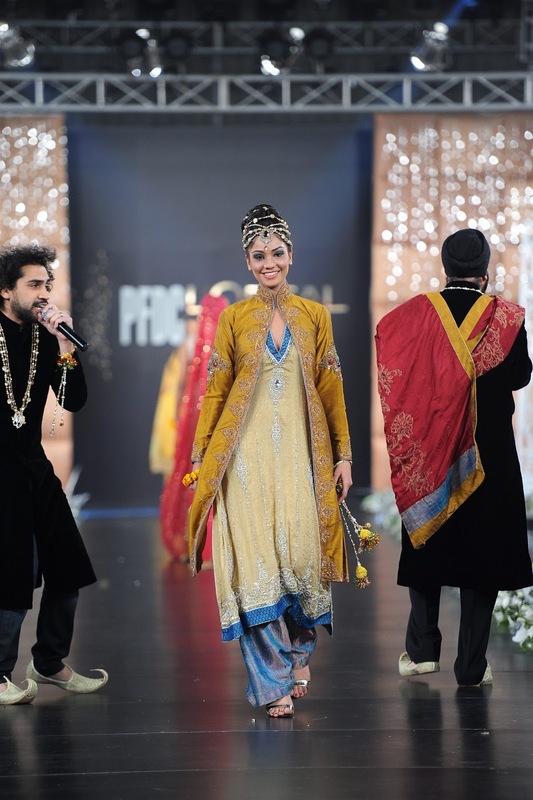 I must say it was a "bold and beautiful " collection as mostly dresses were backless . 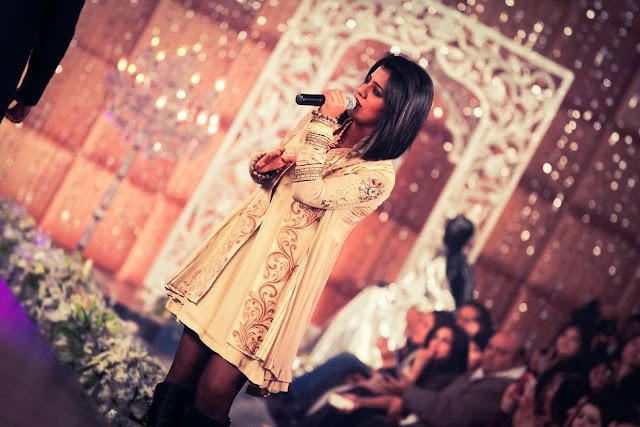 Love the music and the dresses . 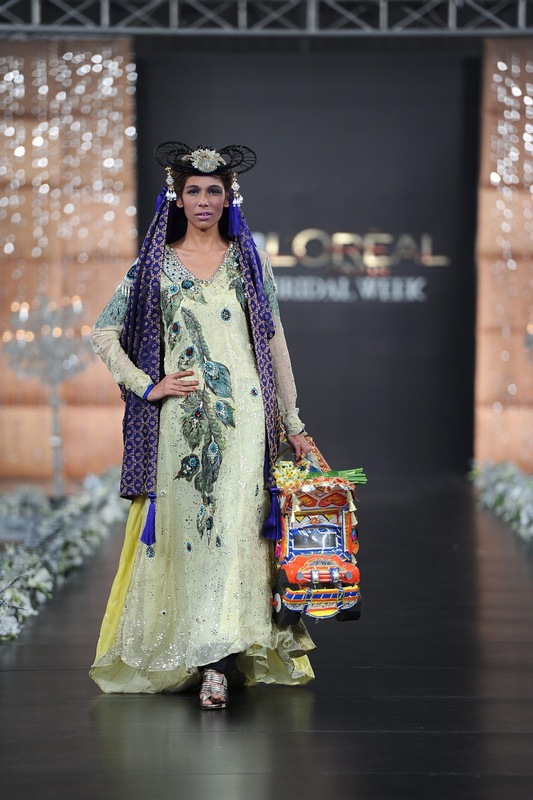 Sara Rohale Asghar’s bridal week collection drew inspiration from the rich wedding culture both in rural and urban Pakistan. 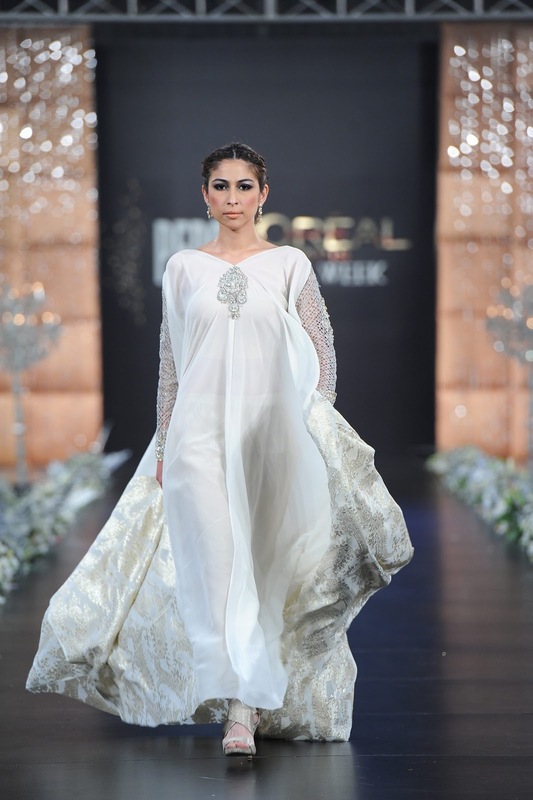 Entitled ‘Tehzeeb-e-Baymisaal’, the collection consisted of a wide range of chiffons, silks, keem khabs, jamawars and zarris. 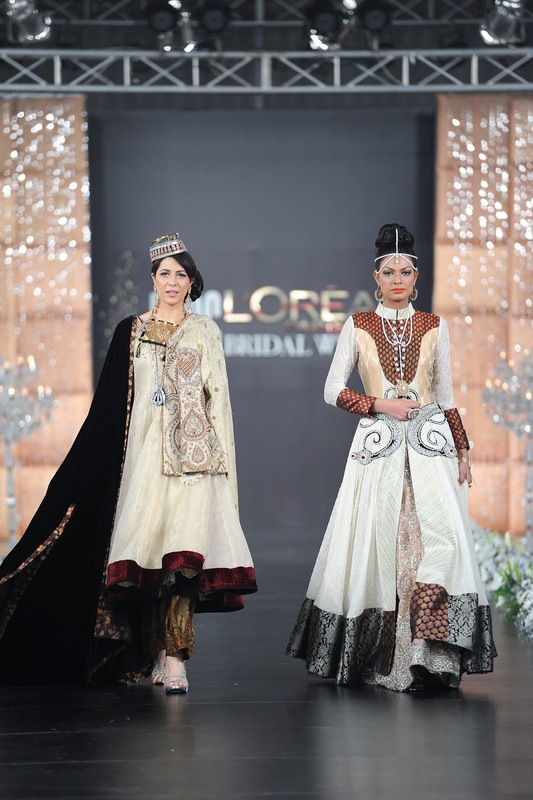 With a variety of cuts such as a-line, structured to the more flowy silhouette, S.R.A.’s collection for PFDC L’Oréal Paris Bridal Week maintained her signature style embellishment with intricate detailing using dabka, stones and gems. 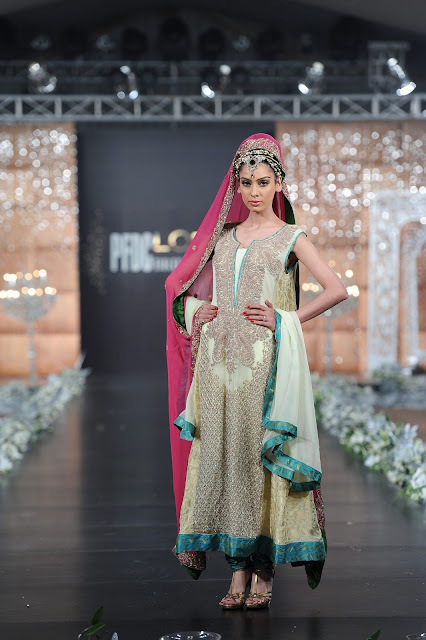 A collection set in a range of colours, ‘Tehzeeb-e-Baymisaal’ had been made specifically for a range of wedding ceremonies such as the Mehndi, Baraat and Walima. Canadian-Pakistani band “Josh” performed live for Sara Rohale Asghar performing a medley of their popular songs. Oh my my what a fabulous show it was . 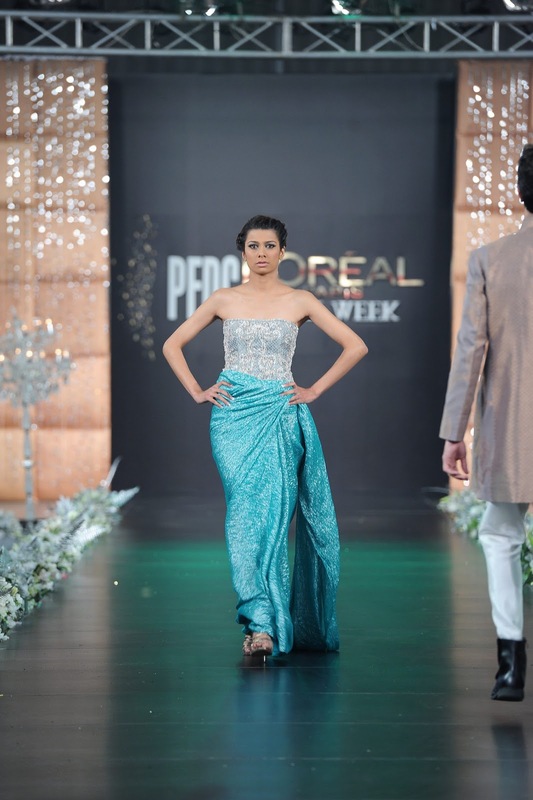 Josh were performing on the ramp and the models were passing them by with little dance moves wearing ravishing bridal clothes. 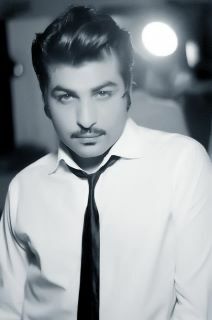 I love it ! 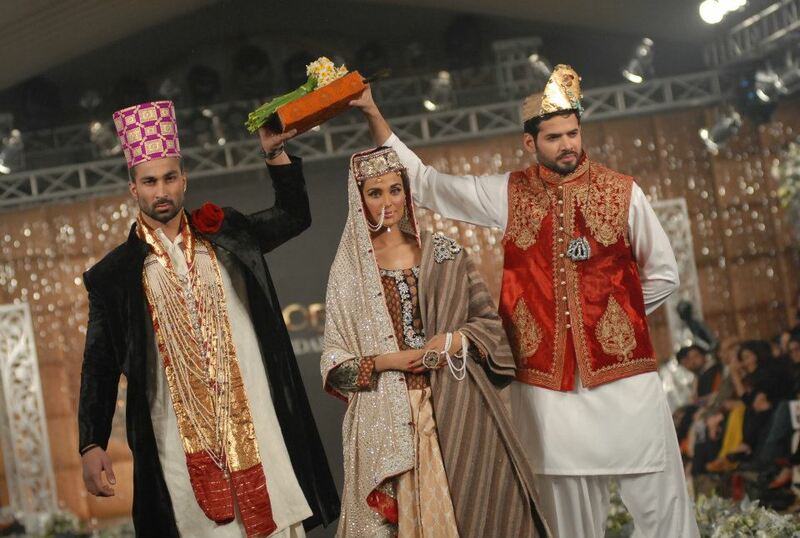 The day closed with Asifa & Nabeel’s bridal week collection, titled ‘Ottoman Royalty’. 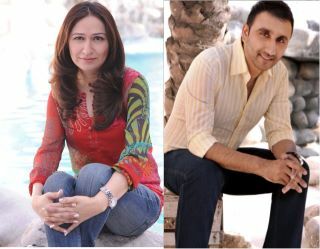 The collection was inspired from the treasures of Ottoman sultans such as the armour worn studded with diamonds, coffee sets in solid gold studded with rubies and emeralds and followed the history of the defeat of the Ottomans by Kemal Ataturk, forced to leave behind their prized possessions, including the famous peacock throne of Bahadur Shah Zafar. 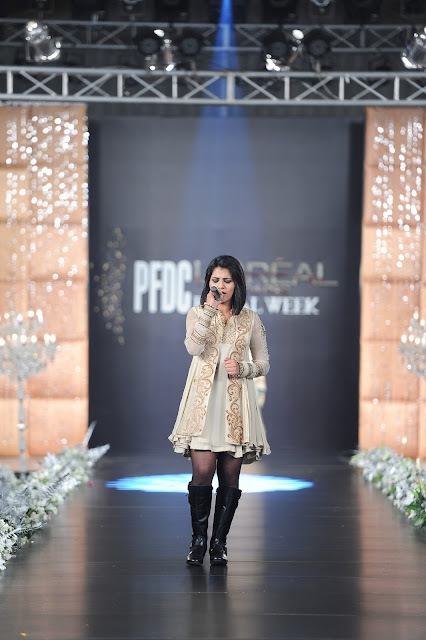 The show opened with the title song of popular Pakistani television serial “Humsafar” sung live by musician Quratulain Balouch (QB), which was followed by another live musical performance by singer Bilal Khan. The show concluded with another song by QB. Three words AWESOME AWESOME and AWESOME. I love QB and so far third day was the best with all its surprises and rich bridal collection. Having the opportunity of attending the PFDC L’Oréal Paris Bridal Week was an opportunity of a life time . 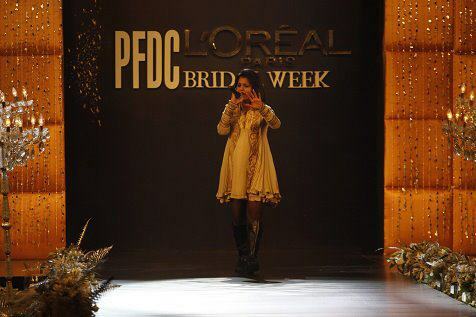 Big round of applause for PFDC and L'Oreal Paris for arranging such an organized and mesmerizing event. 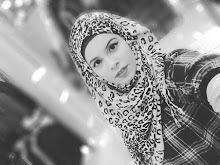 Hope you like my post beauties. Stay tuned for Day 4 updates . 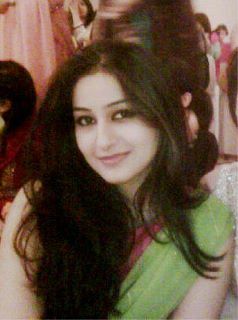 For more pics and updates check and Like my Facebook Page or L'OrealParis Pakistan Fan Page . Meanwhile stay healthy and happy .